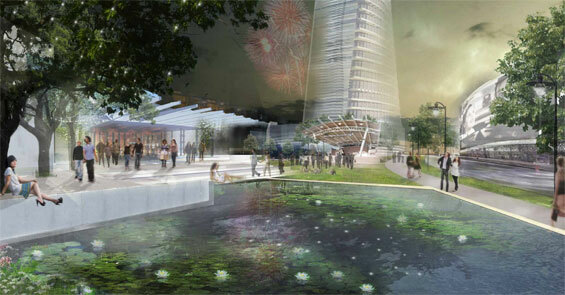 A joint team of students representing the University of Colorado and Harvard University has won the 2012 Urban Land Institute (ULI)/Gerald D. Hines Student Urban Design Competition with “Bayou Commons”, a long-term redevelopment plan for a new downtown Houston district that includes public open space, integrates into the existing fabric of the surrounding neighborhoods, and brings residential units into the city’s core. The joint team edged out teams from University of California-Berkeley, Columbia University, and the University of Michigan in the final round of the competition, held April 6 in Houston. The three finalist teams split $30,000 in prize funds. 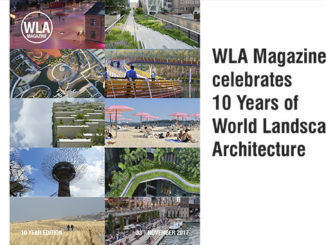 The competition was created in 2003 to encourage cooperation and teamwork–necessary talents in the planning, design and development of sustainable communities–among future land use professionals and allied professions, such as architecture, landscape architecture, urban planning, historic preservation, engineering, real estate development, finance, psychology and law. World-renowned real estate developer Gerald D. Hines, chairman and owner of the Hines real estate organization, established the competition and has funded it in perpetuity with a $3 million endowment. He attended the final round and the announcement of the winner. More than 695 students comprising 139 teams from 64 universities in the U.S. and Canada participated in this year’s ideas competition, which addressed Houston’s desire to connect downtown redevelopment to incorporate connections to the city’s neighborhoods. Students were challenged with creating a practical and workable scheme for the best use of approximately 16.3 acres owned by the United States Postal Service (USPS). The competition focused on the USPS property since it is considered by many stakeholders to be a key site to reconnect the Theater District, the Historic District, and the greater downtown to the Buffalo Bayou. The downtown post office was one of several hundred USPS properties put up for sale nationwide in 2009 to offset the federal agency’s financial losses. 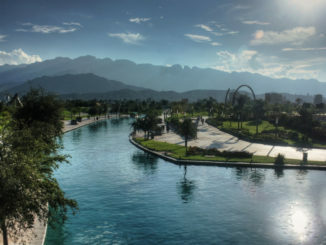 Since that time, land planners and real estate experts have suggested numerous possibilities for the property, which have included converting the land into public open space, mixed-use development that includes residential housing, as well entertainment venues. The competition was based on a hypothetical proposal in which a fictional entity, the Central Houston Foundation (CHF), acquired the option to purchase the site and establish redevelopment goals and connections to the surrounding areas. According to the scenario, the CHF committed a large endowment to both community development and the sustainable growth of Houston’s downtown in hopes of generating a revenue stream for its endowment, while giving shape to a new downtown district. In order to meet the owners’ demands, the student teams acted as a master developer by proposing a master land use plan for the development site as well as supplying financial projections needed to support the master development plan. The winning proposal, “Bayou Commons,” was strategically designed to be downtown Houston’s first residential district celebrating cultural diversity and urban lifestyle. The master plan, originally named “Downtown Bayou,” was re-branded after the team considerably refined and expanded their initial proposal following University of Colorado/Harvard University team’s final four selection and site tour in early March. 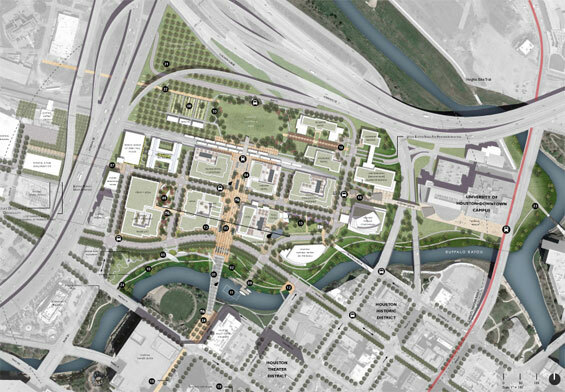 The Bayou Commons design focused on attracting a mix of ethnic and socio-economic individuals through its enhanced Buffalo Bayou waterfront, variety of residential product, connection to adjacent districts and the University of Houston-Downtown campus, safe community environment, entrepreneurial office space, and new commuter rail station. 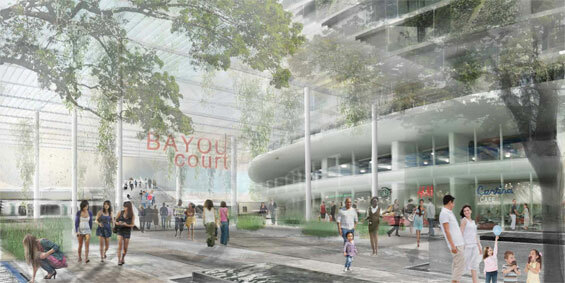 The scheme’s distinctive features for the site include: an iconic pedestrian bridge spanning the bayou, unique architecture and amply-shaded sidewalks that create comfort and re-establishes downtown outdoor enjoyment in the hot and humid Houston climate, a new cultural center for exhibits and performances. The team designed Bayou Commons to be market-driven and phased to ensure each chapter of development creates a desirable place to live and interact. In addition, the master plan celebrates Houston’s culture while fulfilling the city’s desire of catalyzing residential development and future downtown revitalization. In addition to team leader Murphy, other team members included: Michael Albert, master in landscape architecture, Harvard University; Victor Perez Amado, master in architecture, Harvard University; Alex Atherton, master of business administration in real estate, University of Colorado; and Anna Cawrse, master of landscape architecture, Harvard University. Anita Berrizbeitia, professor of landscape architecture and director of the master in landscape architecture degree programs at Harvard University served as faculty advisor and Kurt Culbertson, chairman, Design Workshop, Aspen, Colo. as professional advisor to the team.